Some of you may have noticed I’ve been sniping around for the past few weeks. 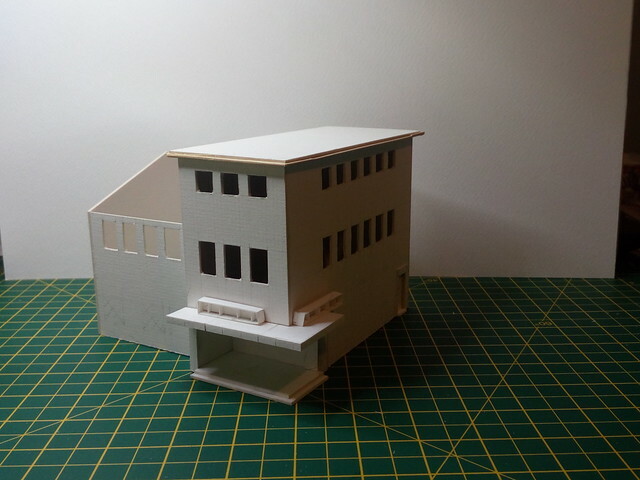 I thought I should be more constructive and post some modelling. I’ve not really modelled railways for 2 – 3 years now, but the bug is back and I’ve returned to my roots, and dusted off my collection of German N Gauge. 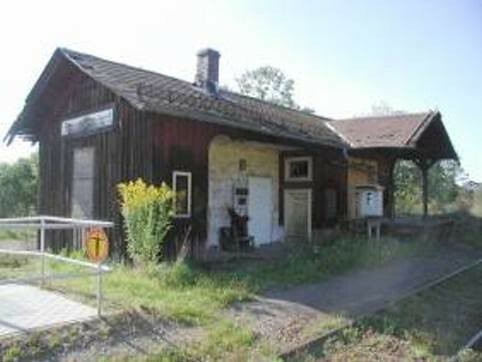 Those of old will remember I first posted back in 2005 with a Bavarian pre-war terminus (as clichéd to the Germans as a GWR terminus is to the UK). 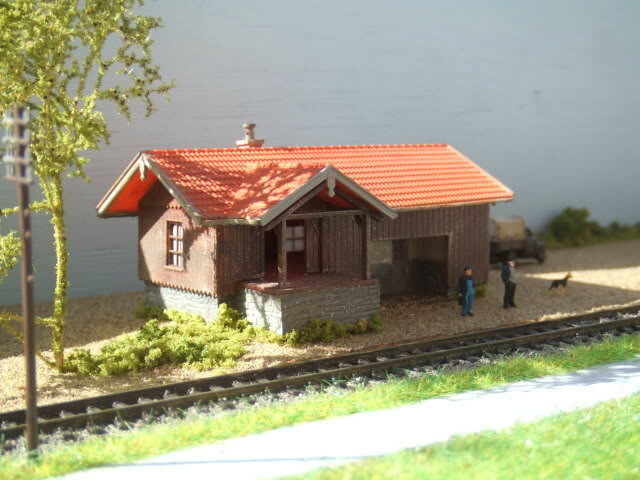 I’m going to build another terminus, though much simplified from my original one, and in parallel I’m going to re-visit a small module I built of a tiny passing station with a siding. This latter exercise will allow me to get my eye back in and to experiment with some ideas I’ve had recently. Photobucket has expurgated my online presence with an efficiency worthy of Stalin, I’ve managed to track down a few old pics of the module to give you an idea of what I hope to do. I always liked the way the light caught this view. 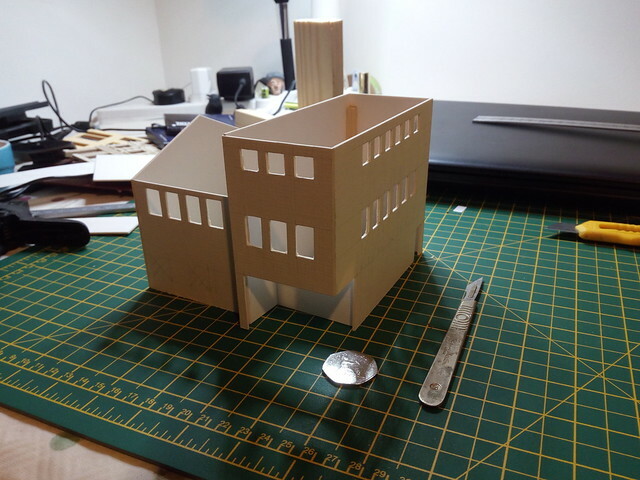 I think I’ll post here in Workbench before I start the proper layout. 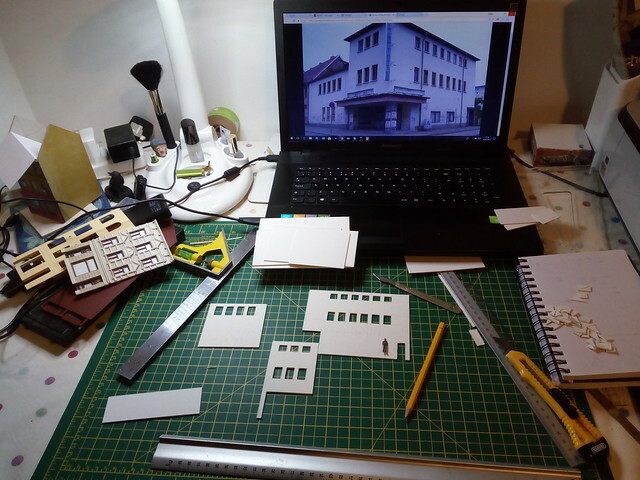 (I am a luddite when it comes to modelling so no DCC or anything, just analogue and manual points, at best you might get an LED illuminating a building, sorry folks). Last edited by Pete on Sat Feb 17, 2018 6:52 pm, edited 1 time in total. What no scary lighthouse ? Germany - So will it be SCARY .......?? Looks good. Well, the simpler you make things the less time you spend trying to fix faults or setting things up etc, so simplicity can be a huge blessing in this hobby of ours! If you want your world to be scary embrace the Unheimlich that's where the Grimm tales come from, inner angst of your surroundings. I enjoy the modelling predominantly, and the challenge of how to make something, I understand for many it's one of the pleasures to dive into the electrics and electronics and with great effect, there's some clever stuff being done no doubt about it. I have a trusty Gaugemaster controller that suits my needs, I rarely actually run the trains anyway, no time I like to spend my time worrying about making N Gauge runner bean plants and stuff. My day job is full of complexity, at home I like to switch off. Can't wait to see this materialise. 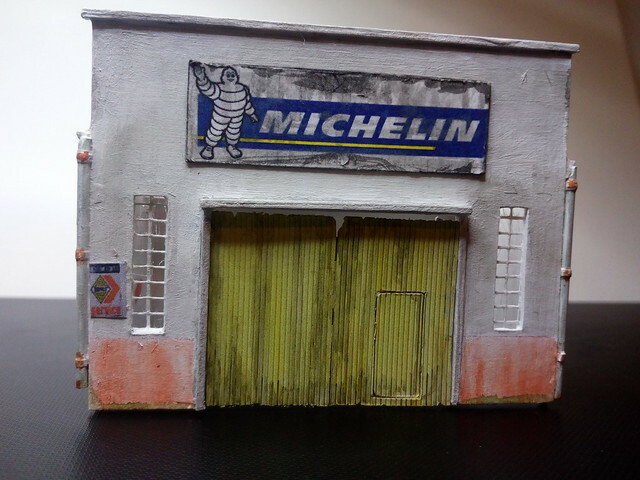 We are blessed with a wide range of modelling themes and eras on this forum. 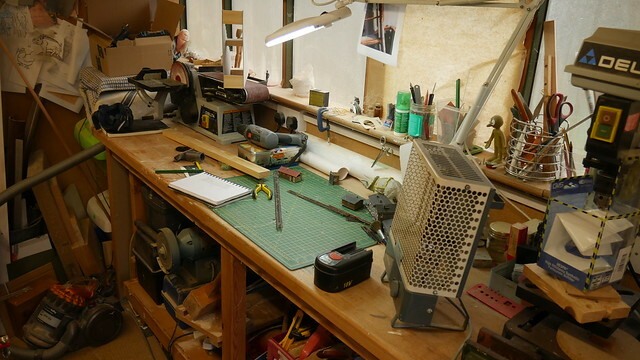 Today finds a very untidy workbench. N Gauge fun has drawn to a halt, too cold and wet to be up and down to the shed, I'm also waiting for a couple of German reference books that I thought were lost (rather than loaned to someone) to be returned in a few weeks. 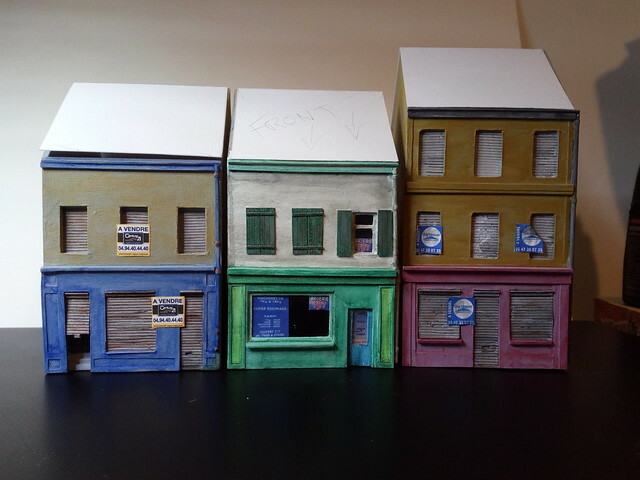 In the mean time I thought I'd make some buildings, just for the fun of it. 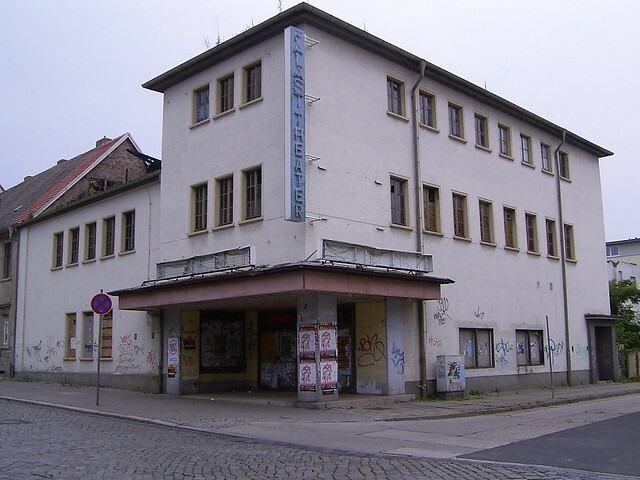 Combining my interest in German cinema, I thought I'd build one , and a shut one at that in H0. Loads more to do, but it's taking shape. 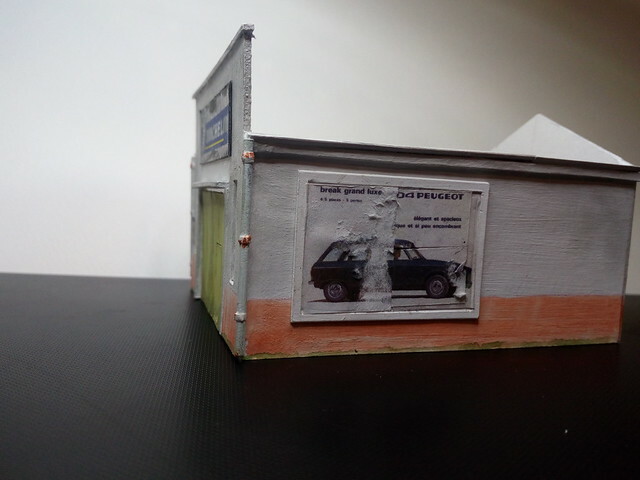 About a year ago I made some tatty and closed up French shops and a workshop, I don't think I posted them here (if I did photobucket ate the images), so a couple of shots, these are made entirely from card, with some micro copper tube for drainpipes. Those buildings are fantastic! It it the way you paint them that brings the extra atmosphere to them. Pete wrote: My day job is full of complexity, at home I like to switch off. I know just how you feel, I retired from two or three hundred users at any one time who all thought they knew exactly what they were doing, with a significant number who's goal was to cause chaos. 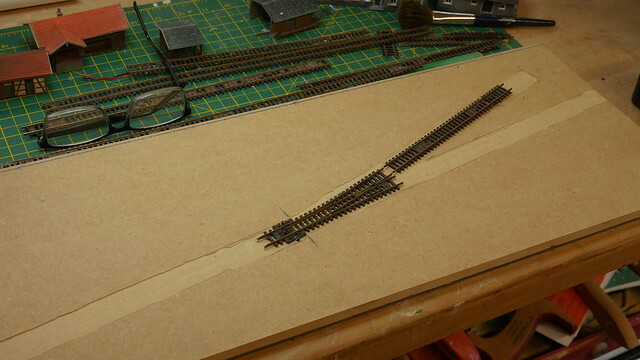 So my current layout is DC with mechanically operated points and signals. If I need the complexity and technology I have a retirement job, providing the technology for Mrs W who writes exam papers for international exams in IT and Computing, as well as the occasional text book. Brilliant cinema build and the shops are fantastic. As said previously, its the paint finish and added details that set them off. The torn advertising hoarding, for example, an observation of the things around us that many would just look past. All I can say is just keep building what catches your eye !! The guttering, which isn't shown that clearly in this pic, is made from split bamboo skewers, you just cut the ends square, insert the blade into the end across the diameter and they split easily in half, they don't look too bad once painted. It's each to his own, I totally understand why people get into the electronics and now 3D printing/laser cutting etc. it's moved the hobby on leaps and bounds, there's some fantastic work being done (as seen in many threads on here); I just enjoy the tactile nature of making things by hand. Anyway, that's probably my last post on this until next weekend, a busy week ahead.